The first time I invited Hubby over for Christmas Eve dinner he fully expected to die from food poisoning of the Ukrainian variety. That is, too much starchy, heavy food that includes grains that were either sickly sweet or mushy. And don't get me started on the pickled fish or sauerkraut and peas. Death by Food, that's what Hubby called it. Then he ate the meal, all 12 courses. Ate would be an understatement. Devoured is more like it. And he lived to tell the tale. Rather, he lived to tell me that I was crazy and that Christmas Eve dinner was a fantastically delicious meal. Christmas Eve dinner always starts with Borscht - that classic red beet soup. The next few dishes are, well, something I can't stand (Kutia and Kasha), but the borscht always made me happy. Except when we ate my Baba's soup and she put peas in it. In honour of Ukrainian Christmas on the 6th I wanted to share this recipe. This recipe does not include peas. Thank goodness for that. 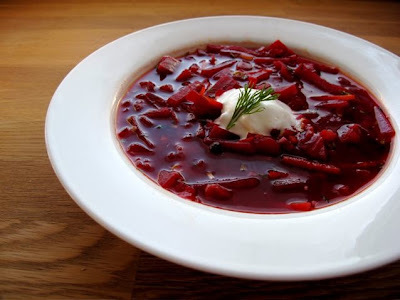 Borscht is essentially a beet based vegetable soup. You can add in other veggies, but I stick to adding beets and a few carrots to onions, celery, and garlic. A browse through any Ukrainian church cookbook will turn up a variety of recipes claiming to be Russian style or Dukhobor style. I can't speak to them, but potatoes do not belong in borscht as far as my family is concerned. My Baba also often made hers with a ham bone, but to this is easily kept vegetarian by keeping the bone out. Then there is the issue of exactly how to prepare your beets. Pre-cooked versus raw in the soup? Chopped, grated, shredded, or sliced? I've settled on roasting, then peeling my beets. And I am firmly in the camp of slicing my beets into matchsticks. It provides a bit of toothiness to the soup, but not as much as you would get if you diced the beets. Yes, it takes longer, but it is a perfect Sunday morning activity with a three year old and a butter knife by your side. 1. Heat oven to 350 degrees F. Trim ends from beets, toss with a little bit of vegetable oil, salt, and pepper. Roast in oven for 1 and 1/2 hours. Let cool completely. 2. Peel the beets. Julienne into 1/8 inch sticks, about 1-1.5 inches long. Do the same to the carrots. Set aside. 3. Finely dice the onion and celery ribs. Saute with vegetable oil until soft. Add in garlic and saute an additional 30 seconds. 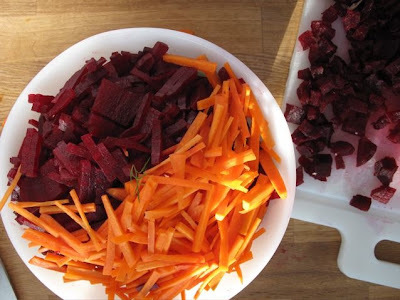 Stir in beets, carrots, tomatoes and their juice, and 6 cups water. If using the ham bone add it now. Let simmer over low heat for about 2 hours, covered. 4. Turn off the heat, stir in the celery leaves and dill. Season well with salt and pepper. 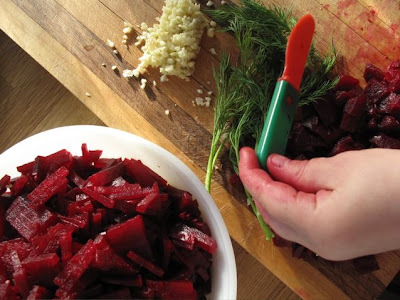 You can serve it immediately, but borscht benefits from sitting a day or two. 5. To serve, garnish with a dollop of sour cream or creme fraiche. Alternatively, drizzle with some heavy cream. The Universe is conspiring against me. I take beets off my list of vegetables to learn to love and immediately you post this? I'll take the hint and give it a try. That Borscht looks so good. Yum, love borscht. I didn't grow up with it, but no matter - have you made it with golden beets? Looks delicious, I'm going to bookmark this recipe. 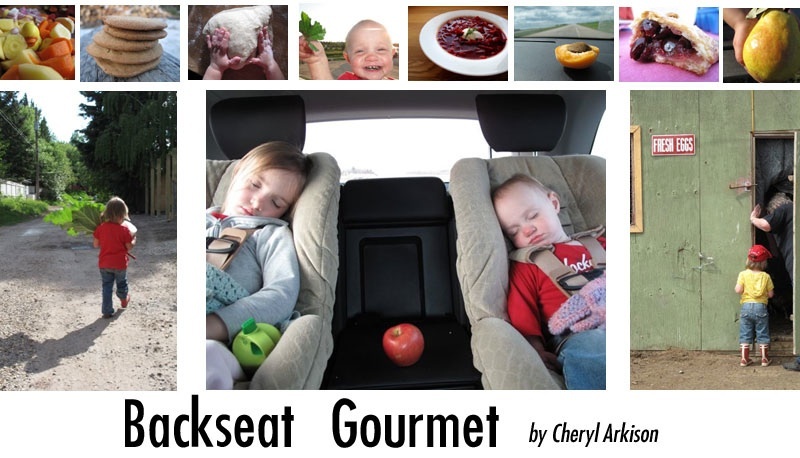 I've always loved borscht! I made this last night after my boyfriend's Mom refused to give me her recipe (apparently she just throws it all together...) I subbed beet leaves for the celery leaves and added some oregano and ran the immersion blender through it. I really like it, much better than the Polish tetrapak stuff, or as the boyfriend said "very good for borscht made by an Asian"